This book marks the first time that I've seen the use of the term "Gift Edition" for an unsigned, but limited edition of a SK book. The next use would be Nightmares & Dreamscapes in 1993. 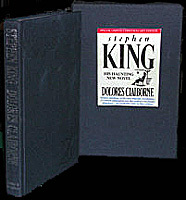 The term "Gift Edition" appears in the USA the next year with Insomnia by Ziesing Books in 1994.